Thousands of Dollars Per Year! 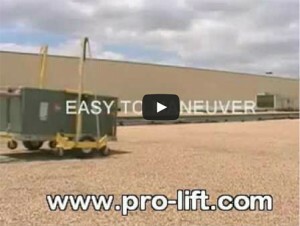 award-winning Pro-Lift B1230 AC Lift! This proprietary tool eliminates the need for large crane rentals and helicopters for commercial and residential HVAC installations. 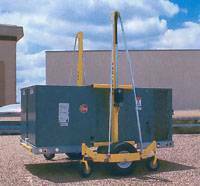 The PRO-LIFT Model B1230 (patent pending) is a one-of-a-kind AC lift which allows HVAC units to easily be moved on a rooftop. This AC lifting and transport system is battery operated to allow for complete portability. Each side of the dual-piece HVAC dolly has a large pneumatic main tire plus spring-loaded front and rear castors to provide a zero-turning radius. With this AC lift, you can easily roll a unit weighing 1,500 pounds over an uneven surface (3,000-4,500 pounds using multiple sets). Furthermore, since nothing extends underneath the AC unit, it is no problem to place it directly on the roof curb! *The Pro-Lift B1230 AC lift was the Silver Second place winner in the Tools category of the 2006 Dealer Design Awards program, sponsored by The Air Conditioning Heating & Refrigeration News magazine. Watch the videos of this incredible AC lift tool in action! Call us today and place your order for this incredible money-saving tool! Contact Us For a Freight Quote Today! !